Quantum cryptography today uses optical fibre over several hundred kilometres and is marked by its high degree of security: it is impossible to copy or intercept information without making it disappear. However, the fact that it is impossible to copy the signal also prevents scientists from amplifying it to diffuse it over long distances, as is the case with the Wi-Fi network. Since the signal cannot be copied or amplified without it disappearing, scientists are currently working on how to make quantum memories capable of repeating it by capturing the photons and synchronising them so they can be diffused further and further. All that remains is to find the right material for making these quantum memories. "The difficulty is finding a material capable of isolating the quantum information conveyed by the photons from environmental disturbances so that we can hold on to them for a second or so and synchronise them," explains Mikael Afzelius, a researcher in the Department of Applied Physics of UNIGE's Faculty of Sciences. "But a photon travels around 300,000 km in one second!" This meant the physicists and the chemists had to unearth a material that is very well isolated from disturbances but still capable of operating at high frequencies so that the photon can be stored and restored quickly—two characteristics that are often considered incompatible. Although laboratory-tested quantum memory prototypes already exist, including those based on rare earths such as europium or praseodymium, their speed is not yet high enough. "So, we turned our interest to a rare earth from the periodic table that had only received little attention so far: ytterbium," explains Nicolas Gisin, professor in the Department of Applied Physics in UNIGE's Faculty of Sciences and founder of ID Quantique. "Our goal was to find the ideal material for making quantum repeaters, which involves isolating atoms from their environment, which tends to disturb the signal," adds professor Gisin. And this seems to be the case with ytterbium! The UNIGE and CNRS physicists discovered that, by subjecting this rare earth to very precise magnetic fields, the rare earth atom enters a state of insensitivity that cuts it off from the disturbances in its environment, making it possible to trap the photon so it can be synchronised. "We found a 'magic point' by varying the amplitude and direction of the magnetic field," say Alexey Tiranov, a researcher in the Department of Applied Physics at UNIGE, and Philippe Goldner, a researcher at the Chimie Paris research institute. "When this point is reached, the coherence times of the ytterbium atoms are increased by a factor of 1,000, while working at high frequencies!" 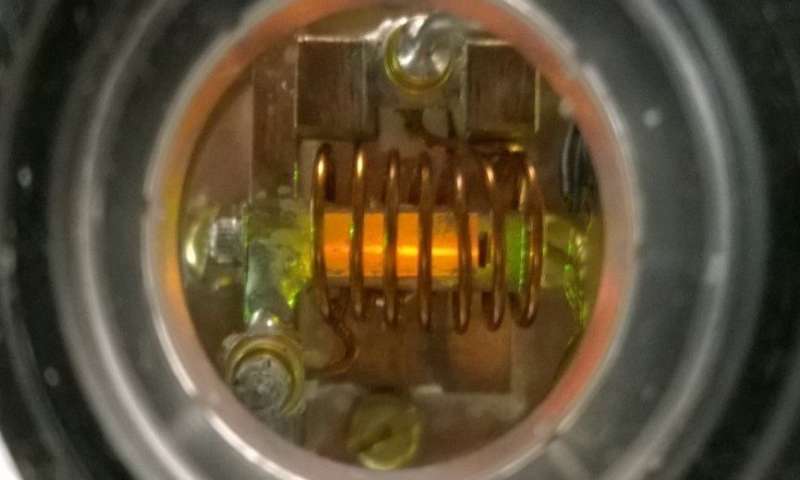 The physicists are now in the process of building ytterbium-based quantum memories that can be used to quickly make transitions from one repeater to another while retaining the photon for as long as possible to enable the necessary synchronisation. "This material opens up a new field of possibilities for creating a global quantum network; it also underlines the importance of pursuing fundamental research in parallel with more applied research, such as devising a quantum memory," concludes Afzelius.